Lotus Rock is a revolutionary, new product which not only has an excellent Lotus-effect non-stick but also a rock hard quality. These two attributes make it the ideal, long-term use cookware and bakeware utensil for your kitchen. The Lotus Rock coating is metal utensil safe, with excellent abrasion resistance. It is PTFE/PFOA free, with high heat resistance – so it is much tougher and more eco-friendly than a general non-stick coating. The top silicon-oxide crystal coating has a lotus-effect non-stick because it is hydrophobic (water-hating), while at the same time being lipophilic (fat loving) for the consumer to ‘season’ the pan themselves for an excellent non-stick release. However, unlike uncoated steel or cast iron pans which even after being seasoned still have a reactive surface for cooking, with a Lotus Rock pan all kinds of acidic ingredients such as lemon juice, tomato sauce, wine and vinegar can be used. 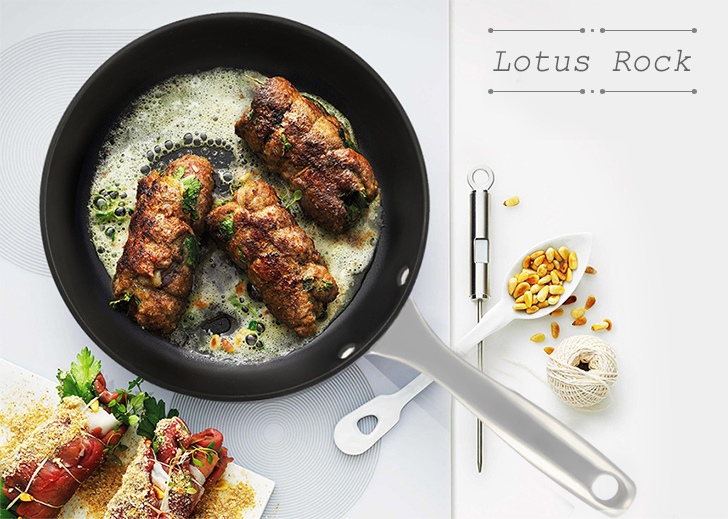 The high thickness of the ceramic-like coating along with the heavy gauge carbon steel substrate between it gives Lotus Rock pans an excellent heating effect for high nutrition content, delicious tasting food. A natural, renewable non-stick effect; alongside a highly durable construction; with a great cooking effect: Lotus Rock is a new, highly innovative cookware and bakeware range that can be used and enjoyed in your kitchen for many years to come! Have an Echo Exdura Lotus Rock fry pan that has started to stick. I am so disappointed. Any suggestions?
. Dear Sailie, thank you for your question with us about the non-stick effect of a Lotus Rock pan. Please go to our FAQ page here http://lotusrock.com/faq/ and you will see there are answers to your question in the relevant blog post links. If maintained well and from time-to-time repurified a Lotus Rock pan’s non-stick release should last for a lifetime.
. Can I use these pans in an oven? I really bought it to make cornbread at 450 degree temperature.
. Dear Gail, thanks for your enquiry with us. I do not know which handle you are using, if it is either our bakelite or wooden handle, then it is not oven safe. If on the other hand your handle is mae of stainless steel, then you can put it in the oven to make cornbread.
. Can you please tell me if these products contain lead, cadmium, mercury, or any other heavy metals? Thanks! I have loved my Lotus rock pans, purchased last year at Marshalls in Boston. I have tried to buy more as l love it, but bone of my local Marshalls seems to have any. I really want to buy more, it is far better than my Calpholon. Where can l find it? Also. Is there a site showing all the Lotus Rock products? Thank you.
. Dear Mitchell, we are happy to know you are really enjoying your Lotus Rock fry pan. Actually just last month a wider range of items for Lotus Rock, with a new stainless steel handle, have been confirmed for sale in in not only Marshalls but also TJ Maxx & Homegoods stores thoughout USA. Items will include frying pans, a grill pan, grill pro, crepe pan, and a paella pan. They should be available to purchase around early Summer time. I noticed another brand called masterclass using this technology, is it a branch of your company? Where in UK and possibly also in Poland could I purchase your cookware? .Thank you for your enquiry with us here at Lotus Rock. I have replied directly to you via email. Hi, I am from hong kong. How can I buy your pans? Thank you for your enquiry with Lotus Rock, I have replied directly to you by email. You can purchase Lotus Rock frying pans at TJ Maxx, Marshalls or Home Goods stores’ throughout the USA. HI I live in NJ zip code 08861. Where can this cookware be purchased? Lotus Rock Frying Pans, with the Titlis bakeware handle, are sold with the Echo brand cookware in TJ Maxx, Homegoods, and Marshalls. Where can I buy items from the Lotus Rock BBQ Collection? I live in southeastern Minnesota, USA. Please note I have replied directly to your email address for information about where Lotus Rock BBQ items are sold in the USA. I live in upstate new york, USA. Where can I buy your cookware? Dear Ann, just to inform you that I did reply to your message back in July. I hope you are now enjoying Lotus Rock cookware. Where in the world do you live? Then we can advise you where you can buy Lotus Rock.